That’s right. 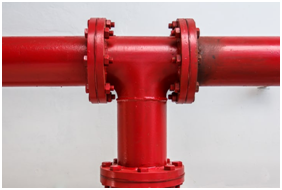 For the piping industry, the American National Standards Institute (ANSI) developed Pressure Classes (or ratings) for different types of flanges used in industrial applications. According to ASME B16.5, forged steel flanges are made in seven primary Pressure Classes: Class 150, 300, 400, 600, 900, 1500 and 2500. More recently called “ANSI class,” the designation for the pressure-temperature rating of a pipe flange is a dimensionless number. Because it is constructed with more metal, a Class 300 flange can handle more pressure than a Class 150 flange. However, a Class 150 flange is rated to approximately 270 PSIG at ambient conditions, 180 PSIG at approximately 400°F, 150 PSIG at approximately 600°F, and 75 PSIG at approximately 800°F. Image courtesy of the American National Standards Institute. Determining or verifying the pressure rating or monitoring the pressure in an application could be accomplished with an appropriately rated All Sensors SPA 402 Series of stainless steel, media-isolated pressure sensors.